Her sire FIGHTING SUN was unbeaten in two juvenile starts before injury ended his career when he was well in Golden Slipper markets. FIGHTING SUN is a young sire son of the brilliant galloper NORTHERN METEOR, who passed away early in his stud career but left us sire sons such as ZOUSTAR, DEEP FIELD and EUROZONE. FIGHTING SUN covered his first book of mares in the 2014 breeding season and the response to his stock has been outstanding with his progeny fetching up to $165,000 in his first few offerings with many other top stables impressed by the sire’s yearlings this selling season. This lovely mover is a daughter of the MONASHEE MOUNTAIN mare Darmasanda, a debut winner over 1100m in Tasmania before notching further wins over 1100m and 1200m, putting good speed into this filly’s pedigree. 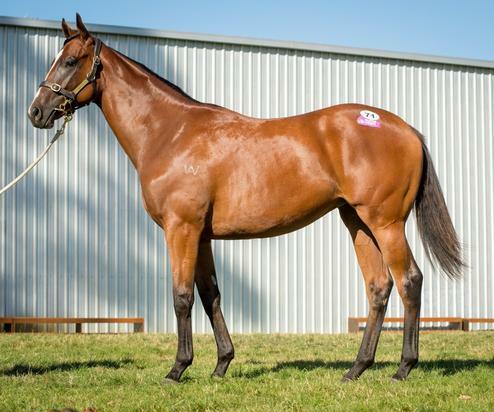 Purchased for $20,000 at Tasmanian Magic Millions - click. FIGHTING SUN (AUS) (Bay 2011-Stud 2014). 2 wins at 2, A$143,750, ATC Canonbury S., L, Membership on Sale 2YO P. Out of SW Irish Darling (SAJC Australasian Oaks, Gr.1). Grandson of a half-sister to the dam of SW Dragon Maiden (Taranaki 2YO Classic, Gr.3). Same family as SW Battle Eve (BOP RC Japan-Bay of Plenty International Trophy, Gr.2), SW King Delamere, etc. His oldest progeny are 2YOs. DARMASANDA, by Monashee Mountain. 3 wins at 1100m, 1200m, TRC Blenheim Inn H., The Tote H., 2d TRC 4one4 Real Estate H., 3d TRC Winzenberg Trophy H., Schweppes H. Dam of two named foals, neither raced. Isis Devil. 7 wins to 1200m, A$77,950, BRC Sirromet 5-Star Winery H.
Darmasanda. 3 wins. See above. Isis Spinner. 2 wins at 1100m, 1450m in Aust. Monnamee. 2 wins at 800m, 1100m in Aust. Isis Cowboy. Placed in Aust. Veni Vedi Veci. Placed in Aust. You Card. Winner at 1100m in Aust. ST JUDE (Godswalk). Third on The 1990-91 Australasian 3YO Classification (1300m - 2000m). 10 wins-4 at 2-from 1200m to 2000m, A$1,907,050, AJC Spring Champion S., Gr.1, STC Canterbury Guineas, Gr.1, VATC Show Day Cup, Gr.1, BATC Robins Kitchen Cup, Gr.2, Stakes H., L, GCTC Magic Millions 2YO Colts S., L, Kyneton Guineas, BATC Doomben Flying H., Keith Noud H., Qld Tatt's RC Victoria Bitter H., 2d STC Rosehill Guineas, Gr.1, QTC Stradbroke H., Gr.1, STC Gloaming S., Gr.2, Peter Pan S., Gr.2, Illawarra TC Brambles Classic H., Gr.3, AJC Kindergarten S., L, 3d AJC Sires' Produce S., Gr.1, STC Premiere S., Gr.3, 4th STC Golden Slipper S., Gr.1, VATC Famous Grouse Toorak H., Gr.1, VRC Bobbie Lewis Quality H., Gr.3. Sire. Danaware. 3 wins at 1600m, 1800m, SAJC Telebet H., AWA Totalisator Staff H., Bells H., 2d SAJC Brave Jon H., Alf Trim H., Brasserie Restaurant H., Cosifits H., VRC Summer Sunday Racing H., 3d SAJC Stallion Income Insurance H.
Amazing Victory. 5 wins at 1000m, 1200m, HK$2,744,300, M$644,700 in HK and Macau, HKJC Yan Chai Trophy H., The Demi-Gods, the Semi-Devils H., Morrison Hill H., Right Way H., 2d HKJC Cho Yiu H., Ho Sheung Heung H., Craigengower Cricket Club Challenge Cup, Hennessy H., 3d Macau Altesse Royale H., HKJC Crusaders H., Midland Property King H.
Syberite. 4 wins from 1500m to 1800m, 3d QTC Members' Bar H.
C'Est le Reve (Revoque). 6 wins-1 at 2-from 1100m to 2000m, A$182,150, M$569,400 in Aust. and Macau, MRC Robert Taranto H., Noel Rundle Tribute Welter H., Lord Dudley H., 2d MRC Blue Diamond Preview (c&g), Gr.3, Carlton Draught H., 3d VRC Racing Hall of Fame in Adelaide H., MRC Le Pine Funeral Services H.
Irish Band. 3 wins from 1650m to 2200m, BTC Anderson Corporation Pty Ltd H., 2d BTC 7CSSB Health Company H.
Chimayo. 2 wins at 1300m, 1800m, VRC Ross Oakley H., 2d VRC Stormy Rex H., 3d VATC Chatham H.
OUT OF DANGER (Atilla). 7 wins. See above. Good Port. 11 wins from 1000m to 3200m, VRC 71 S.
Portal. 5 wins-1 at 2-from 1000m to 1850m, MVRC Sherwood H. Producer.